Contact with deadly silo gases continues to occur wherever silos exist. Although such contact may not occur as often as with other kinds of hazards in agriculture, one should not be lax with safety during the ensiling process. These gases are and will continue to be a very real hazard for as long as silage remains a common livestock feed. 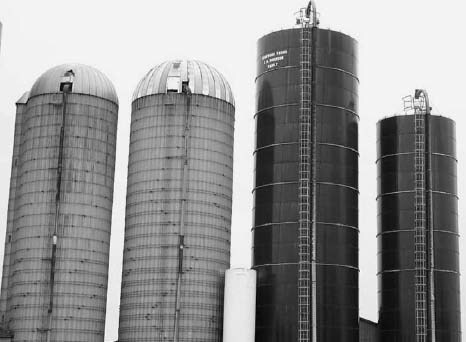 It is important that every farm worker understand the dangers associated with silo gases and learn how to deal with them. Silo gas is formed by the natural fermentation of chopped silage shortly after it is placed in the Silo. At the same time, however, this odorless and colorless gas is dangerous. This gas replaces the silo's oxygen, and in high concentrations, it gives a person little warning that he is about to be overcome by a lack of oxygen. Sealed silos are usually designed in such a way that entering them is unnecessary. A variety of gases are also formed in conventional or open-top silos with nitrogen dioxide being the most abundant. This highly toxic gas is characterized by a strong bleach-like odor and low lying yellow, red, or dark brown fumes. Unlike carbon dioxide, nitrogen dioxide levels reach a peak about three days after harvesting and rapidly begin to decrease thereafter, particularly if the silo is ventilated. The gas actually starts forming within hours of the material being ensiled. After two weeks it is unlikely that more gas will be produced, although some hazard remains if the gas has not been able to escape the silo. Nitrogen Dioxide is harmful because it causes severe irritation to the nose and throat and may lead to inflammation of the lungs. However, what makes this gas especially dangerous is that low level exposure to it is accompanied by only a little immediate pain or discomfort though death can and has occurred immediately, after contact with high concentrations. A farmer might breathe the gas without noticing any serious ill effects and then die in his sleep hours later from fluid collecting in his lungs. Many victims can suffer relapses with symptoms similar to pneumonia two to six weeks after the initial exposure. For these reasons, it is extremely important for anyone who is exposed to this gas, even a short time, to seek immediate medical attention. Like carbon dioxide, nitrogen dioxide is heavier than air. Because of this, as it is produced it tends to settle right on top of the silage or flow down the silo chute and collect in the adjoining feed rooms or other low lying areas near the base of the silo. Gas may even flow into the barn itself and become trapped in corners, under feed bunks, or lie low against the floor. The threat that this poses to livestock is a serious one. Some environmental conditions, particularly drought, cause nitrates to accumulate in plants fertilized with nitrogen, even at recommended rates. 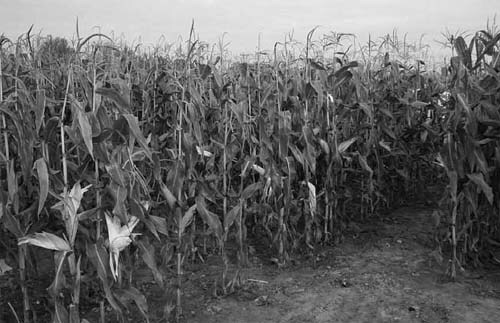 By taking precautions, outlined below, you can fertilize at recommended rates for maximum production of silage crops without fear of excessive nitrogen dioxide production. Proper fertilization combined with good cultural methods such as proper weed, insect and disease control, reduces the chances of nitrogen dioxide gas production when you ensile the crop. Follow the recommendations on soil analysis reports. Use balanced N-P-K fertilizers; add minor elements if needed. Use disease and insect resistant varieties and/or spray to control insect and disease damage to leaves and roots. Keep fields relatively free of weeds. Weeds can make silage dangerous even though there is no excess nitrates in the corn itself. After a drought, plants rapidly take up nitrates following rain. So, harvest the crop before fall rains, or wait at least five days after a rain. Plants damaged by hail or frost should be harvested immediately before they take up nitrates. To reduce the amount of nitrate going into the silage, cut higher than normal (10 to 12 inches). Most nitrates are in the lower stalk. Be alert for silo gas odours and/or yellowish-brown or reddish fumes in or near the silo. Silo gas is heavier than air and will displace oxygen. The greatest danger from nitrogen dioxide gas from silage is during the first 12 to 60 hours after filling. Do not enter the Silo for 4 to 6 weeks after filling stops. Ventilate the silo room adequately for at least two weeks after filling. Open the windows and outside door of the silo room and use fans if necessary. If a silo must be entered, do it immediately after blowing the last load into the structure ensuring the blower is running for 15 to 45 minutes prior to entry. Leave the blower running for ventilation while anyone is inside. Running the Silo blower for 15 to 45 minutes before entering the silo and while you are in the silo will help remove silo gas, but this is not a substitute for a self-contained breathing apparatus. Never enter a silo if you are alone, without a selfcontain breathing apparatus and a life- line, especially during the danger period when gases may still be forming. Get to fresh air immediately if you start coughing or experience throat irritation. Seek medical attention if you suspect you have been exposed to silo gas. Keep all doors closed and the roof panel open for more effective ventilation. This eliminates the danger of, simply moving the gas out of the silo and down the feed chute. There have been reports of livestock being killed from silo gas flowing down the chute and entering the barn. Provide good ventilation to the silo room to dissipate dense gases as they cascade out of the silo during fermentation. If the silo adjoins a barn (or other building), use barn portable barn exhaust fans to blow air into the feed room to overcome some of this hazard. Barn air would then be expelled through the feed room rather than the reverse. A box duct connected over the inside of the fan and extending down to 150mm above the feed room floor will ensure that the heavier -than-air Silo gases are effectively removed. The bottom of the silo chute must be closed off so that the fan will draw air from the stable and not from the silo. Lock up all unloading mechanisms. Always wear a self-contained breathing apparatus if you must enter the silo within four to six weeks after filling. Have three people outside to help if needed. 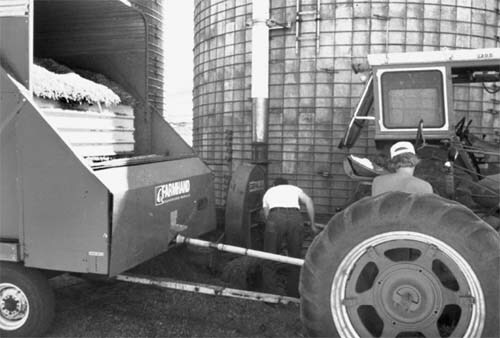 Keep a hatch door open near the level of the silage within the silo. Post all appropriate warning signs. Oxygen-limiting silos require a sign that warns people of the absence of oxygen. People need to be told to stay away from these areas and never enter them. Barricade enclosed silo areas to prevent children and strangers from entering the silo room and silo. During the dangerous loading and fermentation period provide fencing around the Silo base to keep children and animals a safe distance away from toxic silo gases. Air purifying respirators remove contaminants from the air, but can be used only in an environment that has enough oxygen to sustain life. Do not use air purifiers to provide protection from the dangers of oxygen limited environments such as silos. There are two general types of air purifying respirators, those with mechanical filters and those with a chemical cartridge. Mechanical filter purifiers are not for use around toxic gases. Chemical cartridge respirators protect against certain gases and all but the most toxic organic vapors. Powered air purifiers can be mechanical filter, chemical cartridge, or a combination of both. They cannot be used in oxygen-limited environments. Gas masks are more effective than chemical cartridge respirators against high concentrations of toxic gases. Gas masks should not be used in oxygen limited environments. Supplied-air respirators are for use in oxygen-deficient areas such as manure pits; Silos containing silo gas, airtight silos, or bins containing high moisture grain. The information and recommendations contained in this publication are believed to be reliable and representative of contemporary expert opinion on the subject material. The Farm Safety Association Inc. does not guarantee absolute accuracy or sufficiency of subject material, nor can it accept responsibility for health and safety recommendations that may have been omitted due to particular and exceptional conditions and circumstances. Copyright © 2002 Farm Safety Association Inc.
22-340 Woodlawn Road West, Guelph, Ontario (519) 823-5600.